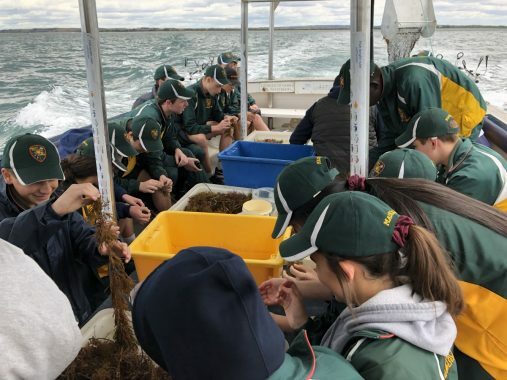 On Friday 9 November 2018, Year 9Gold students from St Mary’s Campus, travelled to Queenscliff, where they consolidated what they learnt from the module Whose Mess is it Anyway? 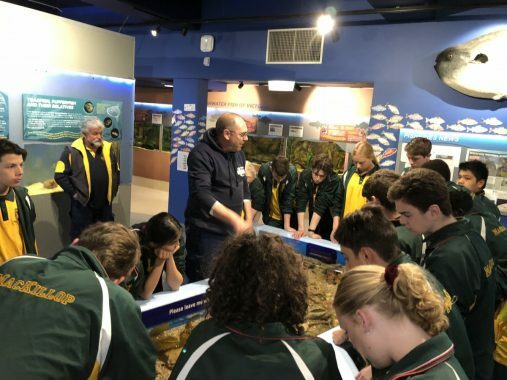 We spent some time at the Marine and Freshwater Discovery Centre, where Phil introduced many interesting facts about the marine life of Swan Bay and Port Phillip Bay. We learnt about many of the fish and marine life on display, the importance of the food web and watched David feed the very relaxed pufferfish. The rockpool gave us a hands on opportunity to learn about marine animals such as starfish, shark eggs and urchins. On Swan Bay we sailed to Chinaman’s Hat where we observed the seal colony at rest and play. On to Pope’s Eye, no longer a parking bay for warships, but a home to nesting gannets where students were undertaking a bird count from the crow’s nest. While on the fishing vessel we looked carefully through sea weed and kelp for marine animals. It was a great day out learning about the ecosystem of Swan Bay.